Experts in resilience planning from around the world have gathered in Amman on June 27th to discuss practical ways of ensuring the resilience of travel and tourism for the benefit of destinations, communities, travel suppliers and travellers. 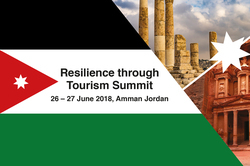 The Resilience Through Tourism Summit brings together speakers and attendees from the public and private sectors, NGOs and media to showcase Jordan and to share lessons, pool resources and establish best practice. The opening session of the Summit this morning was addressed by H E Lina Annab, Minister of Tourism and Antiquities in Jordan. The Ministry is host partner together with the Jordan Tourism Board, whose managing director Dr Abed Al Razzaq addressed the guests followed by remarks by USAID's deputy mission director Dr Lewis J Tatem. USAID is the supporting partner in organising the event. Other speakers in the opening session included Isabel Hill, director of the US Office of Travel and Tourism Industries, Professor Lee Miles of Bournemouth University in the UK, and Deepak Joshi, chief executive of the Nepal Tourism Board. In a keynote address this afternoon, Taleb Rifai, head of the UN World Tourism Organisation (UNWTO) until the end of last year and a former tourism minister of Jordan, will call for travel and tourism to develop deeper “roots in local communities”. Rifai said: “We are talking about how to keep economies going and keep jobs alive. That is important not just for Jordan but all over the Middle East and all over the world. Tourism can do so much that other sectors can’t, but this does not come automatically. H E Edmund Bartlett, minister of tourism for Jamaica who addressed the Summit this morning, said: “Tourism has morphed into this mega-industry. It dominates so many countries’ economies, but with it come enormous vulnerabilities. Tourism is by its nature fragile. It is vulnerable to climate events. It’s sensitive to crime, to terrorism and now to cyberattacks. Bartlett will open a Global Centre for Tourism Resilience and Crisis Management in Jamaica in September. Daniela Wagner, summit organiser and Jacobs Media Group director of international partnerships, said: “Jordan is a country that has constantly striven to maintain peace in the Middle East. It has used tourism as a driver for economic growth and the development of social enterprise initiatives and it continues to drive tourism growth through innovation and promotion. We specialise in creating relevant and impactful events for Tourist Boards, Governments and Travel Companies. Using our global network of influencers and policy-makers we are able to craft an agenda and attract relevant delegates to meet your context and needs. To find our more about how we can create a bespoke event of you please contact us.